markbglife January 28, 2011 Labyrinth: The War on Terror 2001-? I understand that no one actually attempted to design an Artificial Intelligence engine here, but I’m just using the term because a good solitaire system should mimic player intelligence in some ways, plus it just sounds cool. First and foremost, US event cards from the Jihadist hand are never executed. This, in my opinion, is the biggest advantage granted the Jihadist. 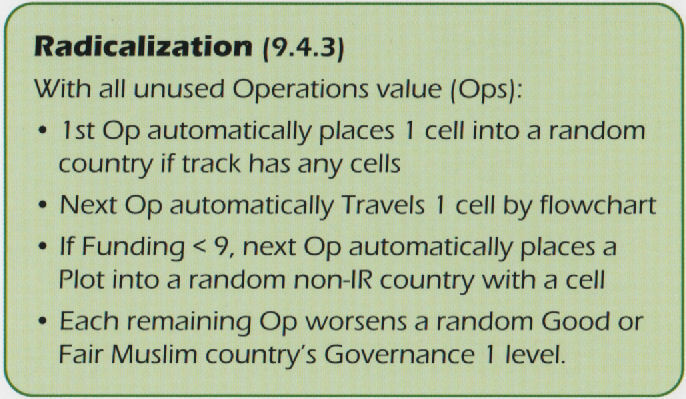 When the US player plays an operations card that contains a Jihadist event, however, it must still be executed as in the 2-player game. An ordered sequence of events that tends to reinforce success. If the possibility of a successful Major Jihad exists, that country will be given priority. Good/Fair Governance countries that are succeptible to Minor Jihads are targeted next, etc. Recruiting is the next operation to be considered. If there’s a regime change country, recruitment will take place there first if it is deficient in terrorist cells. Next in the recruiting order would be Islamist Rule countries with a cell deficit. All other things being equal, Muslim countries with “Beseiged Regime” markers are given priority. And so on. Radicalization (rule 9.4.3) – This powerful solitaire-game-specific operation can be a real game changer. More about Radicalization later. Randomness. There are tables, used in certain circumstances, to generate random locations for cell recruitment, travel and other operations. At times this randomness generates more US consternation that the anaylitical play of a human opponent, since you can’t possibly anticipate or plan for it. You never see it coming. And there are really no inconsequential areas of play. Any place on the map where the Jihadis get a foothold can develop into a major concern for the US player. Jihadist Ideology (rule 9.7) – This is another solitaire-game-specific optional rule that affords the AI Jihadist a variable level of additional advantage (ex. allow Major Jihad if there are only 3 more cells than troops, rather than 5, etc.). Modified Victory Conditions – For example, the US player cannot win by cell elimination. Also the Jihadist requirement to have at least two of its controlled Resource countries adjacent is waived. Finally, the US player is required to have a minimum number of Good Governance resource countries, rather than just having to have 2x more than the Jihadist. So it’s not truly (nor would you expect it to be) a fully developed artificial opponent who plays by the same rules as a live opponent. The imaginary Jihadist is granted considerable advantages that a live player would not get. Next, each operation type has its own sub-flowchart which guides you through the nitty-gritty details of the operation. Each sub-flowchart shows the basic steps in the decision making process, along with notes for specific situations and specific event cards, as well as “priorities” to be used in the selection process when more than one choice is possible. In addition, there are several tables to assist in random selection of countries. There is a “Global” table for all countries, a table for just Shia-Mix countries, and one for Schengen countries. The flowcharts are fairly comprehensive, but you must read section 9 in the rule book (“Jihadist Activities – 1-Player”) in order to understand how to correctly utilize them. There are a number of specific event cards that require special processing, outside the normal direction of the flowcharts. Many of these event cards are listed near the affected flowchart, without much in the way of explanation, some are included in rules section 9.6 under the heading of “Indvidual Event Instructions”, and many are just sprinkled throughout the various paragraphs of rules section 9. After lots of flipping through the rulebook, I decided that it would have been helpful to have a summary table/chart that lists each of these event cards along with the special processing unique to that card. Being the type who would rather light a candle than curse the darkness, I have created a Labyrinth Solitaire Event Effects sheet to share with other Labyrinth players. Place a cell from the Funding Track into a random country, even if the Funding level is exceeded. This is a nice gimme that is unavailable to the living, breathing Jihadist player. Place a Plot, if Funding is less than 9. Automatically worsen the Governance of a randomly selected Good or Fair Muslim country by one level. This is an awesome gimme considering how much work it can be for a live Jihadist player to effect such a change. Radicalization step #1 – Attempt to place a cell from the Funding Track. Can’t do that, so on to the next step. Radicalization step #2 – Travel a cell. A cell is traveled from Afghanistan to Pakistan, which expends one operation point. Radicalization step #3 – Place a plot if funding less than 9. A plot is placed in in the US, which expends a second operation point. Radicalization step #4 – Automatically worsen the Governance of a Good or Fair Muslim country. Saudi Arabia is reduced from Fair to Poor. This expends the third and final operation point. While, after having gone through a few solitaire games, I can’t bring myself to say the system showed any degree of intelligence (as discussed earlier), it certainly showed an appreciable amount of resilience. I’ve played the game quite a bit, face-to-face, and was actually expecting to TROUNCE the phantom, flowchart driven Jihadist in no time flat. That did not happen in any of the games that I played. It’s embarrassing… Every time I thought I had it locked up, some random (or worse, Radicalized) move by my ghost opponent would set me back a step or two. I squeaked out victories in 2 of the 3 games, but they were all close. One pattern emerged during my three (single deck) games: at a point about 2/3 of the way through the deck, I’d end up with two or three large “clusters” of Jihadists. Once they’ve all been Recruited, the subsequent Travel operations tend to force the initially far-flung cells to collapse toward small centers of gravity. Between the restrictions of the Travel directives and the Jihadist events that are played, I ended up with large concentrations of cells in Regime Change, Islamic Rule and “Beseiged Regime” countries (of which there were one of each). Ultimately, of course, the US player will start knocking heads in the Regime Change country via Disrupt operations, and the cells in the “Beseiged Regime” country will either succeed converting the country to Islamic Rule or will just Jihad themselves to death. In any of the above situations, the dynamic is changed; more cells are returned to the Funding Track, and the cycle begins again. Also, I found that the Radicalization rules helped to reverse the clustering, albeit late in the game (although if I were playing a 2-deck or 3-deck game, it would still be considered “early” in the game). I’m not trying to say that the “clustering” effect is a design flaw. It seems reasonable, from a real world perspective, to have this type of activity. And the game system does eventually address and reverse the situation. But for a short time it does bog the game down and becomes a bit tedious. Of course, it’s possible that I’m just not implementing the solitaire rules as they were intended, but this late-game clustering happened in every game. Has anyone else had this experience? I intend to review the rules again with other gamers and will update this article if I find that incorrect reading of the solitaire rules was at fault. Another weak area was the Travel rules. There were many occasions when the flow chart directed me to perform a Travel operation that I simply would not have done if I were in control of the Jihadis. To completely vacate Europe, for example, is generally not a wise move. You want to have at least one cell there to possibly Plot and overturn Postures when necessary. But the solitaire system forces this type of action. I’m not sure how I would fix this, but there should be some mechanism in place to prevent, let’s say, the forced removal of a cell from the United States. The final area that I thought could use some tweaking was the management of the flowchart decision point that says “Event Recruits or places cells?”. If the Jihadist event calls for the recruiting or placing of cells, and there are no cells on the Funding Track, you are directed to “Radicalization”. There are some events, however, that do other things in addition to recruiting/placing cells. For example, the Lebanon War event forces the US player to discard a random card, reduces US Prestige by – 1 and places a cell in a Shia-Mix country. That’s a pretty good event even without the cell placement! I remember thinking that if I were the Jihadist I would have definitely played it. 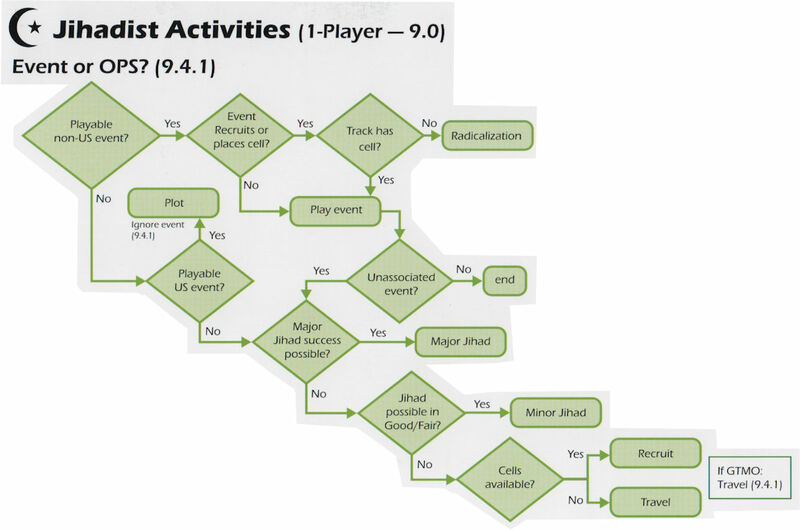 I think the flowchart decision point should be modified to say that if an event places or recruits cells and nothing else, then redirect to Radicalization. It’s possible that my inability to convincingly defeat the invisible Jihadist is due to the fact that I’m a lousy US player. So, my next experiment is to get another gamer to try their hand at solitaire, and I will manage the nebulous Jihadist player to (a) relieve the player of the burden of managing the AI, and (b) make sure that the Jihadist directives are implemented correctly. I’ll report back once I’ve seen a game or two played this way. If you’re not a lousy US player and you find yourself having an easy time whipping the AI opponent, then have a look at the “Jihadist Ideology” optional rules (9.7), which inflict more handicaps on the US player. I’m sure the “Virulent” ideology modifications will provide a challenge for any live player. All the flowchart following, chart checking and die rolling does get a bit monotonous after a while, but that’s a small price to pay for a competitive solitaire game. Overall I’d have to give the solitaire system a thumbs up.